I thank you for being with me on this novena. I ask for your intercession in the health of my daughters and myself. I also ask for those sick friends of mine class 59 and class 67. DEAR BLESSED MOTHER IN JESUS NAME PLEASE PRSY AND INTERCEDE TO OUR SAVIOR AND OUR HEAVENLY FATHER SO RIMPY S IS ABLE TO GET HER CONTRACTOR LICENSE IMMEDIATELY AND BEGIN WORKING WITH ANGIE N AND CHRISTOPHER SO THEIR BUSINESS THRIVES INSTANTLY.PLEASE PRAY FOR JONATHAN H TO CALL RIMPY S SO THEY BEGIN DATING EACH OTHER SERIOUSLY WHICH WILL LEAD HIM TO PROPOSING FOR MARRIAGE TO HER. WE LOVE AND TRUST YOU. THANK YOU, AMEN! 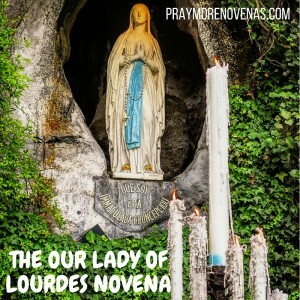 Dear Lady of Lourdes, thank you for hearing our prayers and concerns. Please heal the many hearts that are aching. Heal their pain in their hearts, and bring everyone to the fullness of our Lord Jesus Christ. Please dear God through Mary’s intervention, restore spiritual, mental, emotional, and physical health to my family. Please help my children to grow close to God and the Catholic Church. Please fortify the Church and Her people during these times of crisis. Please help this country once again be one country under God, indivisible, with liberty and justice for all. Thank you God for your many blessings. Please heal us of fibromyalgia, TMJ, heart disease, diabetes, depression, anxiety, asthma, allergies and colon problems. Dear Our Lady of the Lourdes pray my nephew and his wife return to the Catholic Churchwith a deeper faith more than ever; participation, and involvement.. Bless them with beautiful children, with quick conception, smooth pregnancies, and fast, safe, uncomplicated deliveries. Keep them strong with the Holy Spirit. Bless them with healthy, happiness and safety. Increase their faith, and increase mine. Pray for wisdom and guidance as we renovate our home, with few obstacles. I pray for Genevieve and Arlena, being 100 years old, let these days for them be peaceful without chaos.